I need flowers delivered today at the address in Riga (Latvia)! ❶ I need flowers delivered today at the address in Riga (Latvia)! Where can i get flowers delivered today? This question is often asked by customers from Riga and other Latvian cities. Studio KROKUS offers to all clients a service of fast delivery of bouquets and flower arrangements. Ordering mothers day flowers delivered today or birthday flowers delivered today, you will receive a fresh bouquet in 2-3 hours. Make an order online or simply by calling the operator of online shop KROKUS by +371 200 303 06. I need flowers delivered today to the address in Riga or other city of Latvia! Can I make an online order for an express delivery of a bouquet in the online shop KROKUS? I need flowers delivered today online in Riga (Latvia)! A large number of our customers are faced with the problem of an urgent choice of a gift. Often this happens when a person is suddenly invited to some solemn event, for example, a birthday of a colleague or a boss, a friend's wedding, a Christmas dinner, etc. Someone wants to get mothers day flowers delivered today. Some customers spend a lot of time going to the nearest shop, and for hours choosing a suitable gift there. Others simply dial the phone number of the shop KROKUS and boldly say "I need flowers delivered today online at the address in Riga (Latvia)." Especially for such customers, our floristic studio offers the service of an express sending of any of the arrangements presented in the catalog. Asking manager of KROKUS, "Can i get flowers delivered today online in Riga (Latvia)?" you will certainly hear "Yes!" Where can i get flowers delivered today in riga online? The answer is simple - everywhere! Our courier service promptly delivers flowers on the day of the order all over Riga (Latvia). Even if your home or office is in such areas as Bolderaya, Vecmilgravis or Jugla, you can get fresh flowers on time. In addition, it is worth noting that using the delivery service to the exact time, you can take flowers directly during the celebration, so as not to waste energy on their transportation and hand the bouquet to the gifted unharmed. Can I count on flowers delivered today free delivery in Riga (Latvia)? Our company provides services for express delivery of bouquets and flower arrangements for a fee, which is only 10 euros. However, due to the flexible pricing policy of the shop, each client can count on a favorable offer from KROKUS. 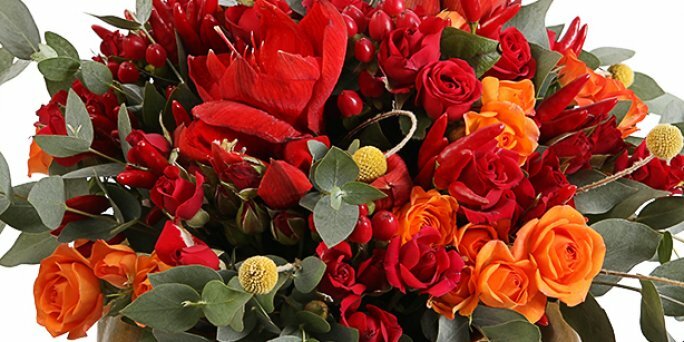 Depending on the amount of the order, we can provide a large discount to wholesale customers, up to absolutely free express delivery of a bouquet in Riga (Latvia). Thanks to the experience gained over the years in the floristic market of Riga and all over Latvia, we were able to save more than one holiday. Birthday flowers delivered today or mothers day flowers delivered today are already pleasing many customers in Riga and other parts of Latvia that is evidenced by their positive reviews on our official social networking pages. Follow the links on the pages of our website and make sure yourself! In addition, by visiting KROKUS photo gallery in Instagram, you can see the recent works of our florists and designers. Perhaps you want to give to your loved one of these bouquets. All your payments occur on secure pages, so all your personal data is protected.